CASE Policy and Legislative chair, Phyllis Wolfram (MO) and I felt amazing support from CEC this past week. We were attending the CEC Children and Youth Action Network (CAN) and National Legislative Conference in DC. This is the first year CEC has opened up the CAN meeting to others and it was exciting to see 85 people learning and advocating for students with special needs. The CEC Policy and Advocacy unit, led by Dr. Deb Ziegler, Kim Hymes and Rose Haller-Kaplan did an amazing job of putting together the speakers, the material, and the resources for this very successful meeting. You can catch up on the great event by #CECLegCon or click here to go to the website. I remember the first CAN meeting I attended and I was just blown away by the potential difference and impact committed advocates can make "up on the Hill." As long as I can remember, CASE executive committee has had their summer meeting in DC so the members of the executive committee could visit with other Association leaders and make the CASE talking points up on the Hill. But after experiencing the CAN meeting, it became clear CASE could make a bigger difference if we had even MORE people meeting with other associations and going up on the Hill and thus was the CASE annual Education Legislative Leadership Summit born. So, we are now in our 12th year and we need to have an even "greater footprint" up on the Hill this year — we need every state represented! Speaking of every state, what about yours? Do you know if your state will be represented at the CASE Educational Legislative Leadership Summit, July 13-16? You can make sure by signing up to attend. This a great opportunity for you to reconnect and be revitalized with your colleagues from your state and with those from other states! We will begin on Sunday July 13 with registration at 4:00-4:55 and the session will begin at 5:00. We will be done by 7:00 p.m., just in time for you to grab some colleagues for a nice evening meal in Old Town, Alexandria! We need every state to have a team attending the 12th Annual CASE Educational Legislative Leadership Summit, July 13-16, 2014. Go to the CASE website to register and click here for the flyer. This year as every year, it is very important for CASE to have as many different states represented up on the Hill for our visit on Tuesday, July 15. There are several really important national issues we will be working on in DC this year with our other association partners. Don't miss this great opportunity. And, with a hotel group rate of $149 at the Hilton Old Town, right across from the King Street Metro stop, this might be a great time to do a DC excursion for you and the family! Group rate ends June 17 so click here to make your hotel reservations! Click here to download a flyer. Watch for the In CASE Newsletter this week! The last edition of the In CASE Newsletter will be coming out this week. It will arrive in your email. Be sure to look at this edition with the 2nd installment of the Essential Points for Principals series and all the highlights of the CASE Annual meeting held in Philadelphia. If you do not get the link by Wednesday, remember you can always find the latest edition behind the MEMBERS ONLY section of the CASE website. Don't forget to do the Poll each week! Last week the question was, "What is your favorite reason for loving your job?" The highest vote getter at 43 percent was seeing the changes in students! There was a tie at 21 percent for working with dedicated colleagues and making a difference in so many lives. There was also a tie at 7 percent for experiencing the changes with teachers and always learning. 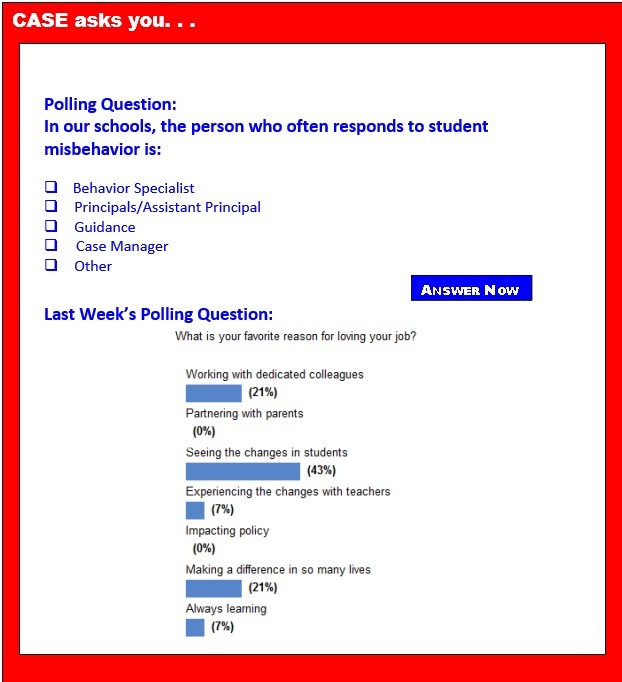 This week's poll is on Discipline. Our Policy and Legislative Committee are looking at discipline and will be gathering your opinions on this and other subjects as they continue to look at recommendations for IDEA reauthorization. Just because Congress is not doing anything is no excuse for us! Let us hear from you! Bookshare's Summer of Sleuths Reading Contest starts Monday, June 16 and promises to be a lot of fun to solve clues about detective and mystery books from Bookshare. Any Bookshare Individual Member can participate. Teachers nationwide are in the classroom 94 percent of the school year, but students may still be getting shortchanged by the more than 1 in 10 teachers deemed to be chronically absent, according to a new report released by the National Council on Teacher Quality. Torrential rain and flash flood warnings did nothing to dampen the spirit and enthusiasm of CEC's National Legislative Conference attendees as they fanned out across Capitol Hill to advocate for children and youth with exceptionalities. The day kicked off with a recognition ceremony for CEC's IDEA Full Funding Champions in Congress — Rep. Chris Van Hollen, D-Md., Rep. Jared Huffman, D-Calif., Rep. Tim Walz, D-Minn., Rep. Chris Gibson, R-N.Y., and Dave Reichert, D-Wash. The move to reduce class size and bring about higher-quality education is a not new one, but it has gained new momentum with a new study. Research by Australian educator David Zyngier shows that there can be significant difference in student performance with a smaller class size. Zyngier analyzed 112 peer-reviewed studies from 1979-2014 to prove how the size of the class can narrow the achievement gap. With smaller classes, teachers can be less occupied with maintaining discipline, and can instead focus on the individual growth of their students. The Facing History School in New York City takes a unique approach to cyberbullying, based in part on its partnership with Facing History and Ourselves, a professional development organization that integrates the concepts of identity, community, responsibility, decision-making and participation into all aspects of its curriculum. By looking at case studies about social injustices, students try to understand the circumstances and decisions surrounding these events and then relate that back to their own experience and communities. Teachers nationwide are in the classroom 94 percent of the school year, but students may still be getting shortchanged by the more than 1 in 10 teachers deemed to be chronically absent, according to a new report released by the National Council on Teacher Quality. Using data from 40 large school districts across the country from the 2012-2013 school year the NCTQ found that, on average, teachers missed nearly 11 days out of a 186-day school year. This is considered frequently absent. Still, 16 percent of those teachers missed 18 or more days — equivalent to about 10 percent of the school year — and were considered chronically absent, the report found. If states' current testing plans remain steady for a year, only 42 percent of the K-12 students in the United States are likely to take common assessments designed by the two federal funded testing consortia, PARCC and Smarter Balanced. Fifty-eight percent of U.S. K-12 students live in states that have chosen other tests, or haven't yet decided which tests they're using. For the third year, public expenditure per student fell nationwide, according to a recent release from the U.S. Census Bureau. Per pupil, school spending totaled $10,608 in 2012, roughly the same amount as the year before. Due to a number of factors, however, spending per student ranged widely among the 50 states. New York was the nation's top spender, at $19,552 per pupil. Utah, on the other hand, spent just $6,206 for every student. Based on the U.S. Census Bureau's latest release on education spending, 24/7 Wall St. reviewed the states that spent the most and least on education per student. When we think and talk about learning, the metaphors we use matter. The language we employ when we describe how learning works can illuminate the process, allowing us to make accurate judgments and predictions — or it can lead us astray, setting up false expectations and giving us a misleading impression of what's going on. One of the most common analogies we apply to education is that of a staircase. As we learn, this model assumes, we steadily ascend in our knowledge and skills, leaving more elementary approaches behind. A child learning math, for example, will replace a simple strategy like counting on fingers with a more sophisticated strategy like retrieving math facts from memory. Physically fit children are not only healthier, they have faster and more robust neuro-electrical brain responses while reading, according to a new study by researchers from the University of Illinois. The findings were published in the Brain and Cognition journal. Although the research doesn't prove that higher fitness directly effects the changes in the electrical activity in the brain, it does offer a mechanism to explain why physical fitness associates closely with improved cognitive performance with a variety of tasks and language skills. Does more school time improve student academic performance? It's a simple question, but researchers have not been able to agree on an answer. Some studies have found that more instructional time does not increase academic achievement in developed countries; other studies that have examined school experiments with time have found that it does. As NPR detailed, teachers and school leaders have a lot of work do to adopt curricula aligned with the new Common Core State Standards. In the Internet era, the best resources should be able to easily leap political boundaries and get into the hands of teachers across the country. But reading and digesting the standards and determining what lessons best fulfill them is a big, big job. And as a result, the media discussion of the Common Core — and thus its political chances — has been influenced by a few pieces of math homework that weren't, frankly, particularly high quality, or necessarily well-aligned. Does handwriting matter? Not very much, according to many educators. The Common Core standards, which have been adopted in most states, call for teaching legible writing, but only in kindergarten and first grade. After that, the emphasis quickly shifts to proficiency on the keyboard. But psychologists and neuroscientists say it is far too soon to declare handwriting a relic of the past. New evidence suggests that the links between handwriting and broader educational development run deep.